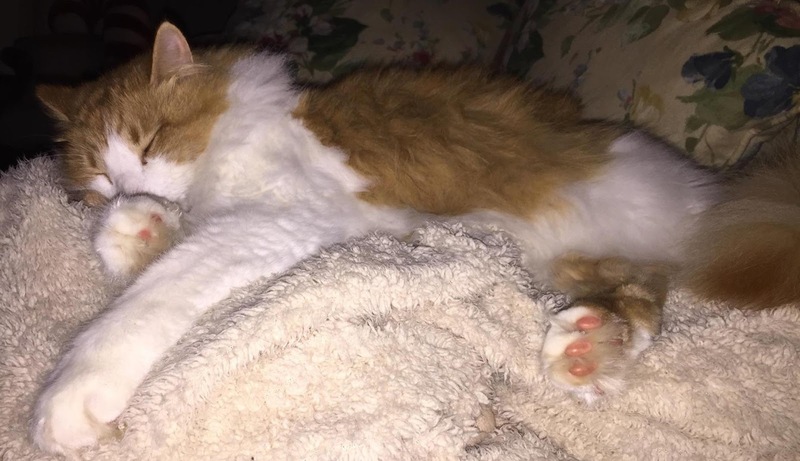 Buckley is a sweet, three year old, orange and white, long-hair boy who lives in a beautiful, natural setting in Covington with his mama, Schuyler. There were lots of trees very close to his house, but Buckley had never been stuck in one before. 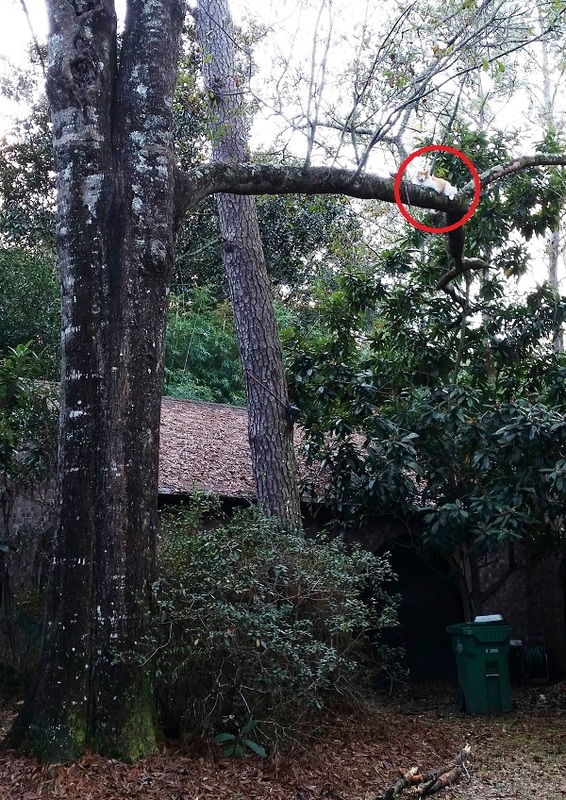 We don't know why he went up this tree just a few feet from his house, but he was stuck there and needed help. He was only fifteen feet high, but the branch he was on was very long and horizontal making it easy for him to walk its entire length. Schuyler tried to coax him down, but he just couldn't find a way to do it. 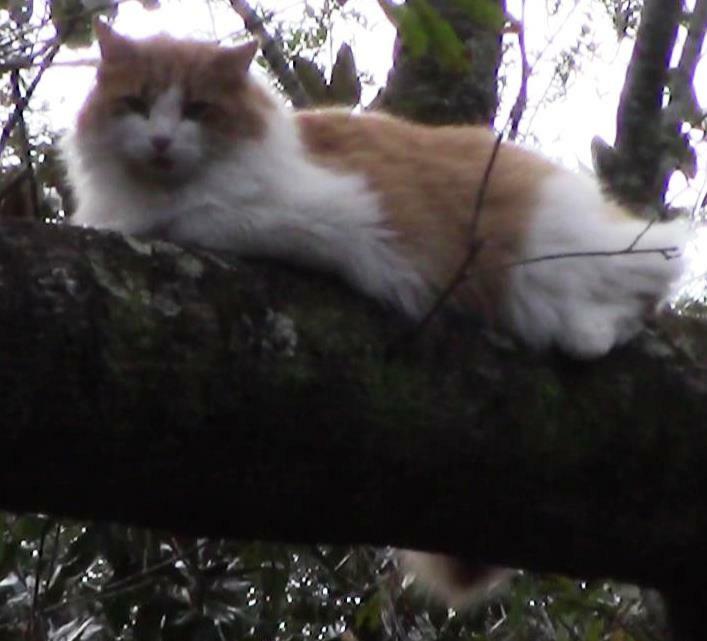 Buckley spent one night in the tree, but Schuyler found me the next morning and contacted me to see if I could help. I already had an appointment to rescue a drone early that afternoon, but I drove to Covington immediately afterward and arrived with about an hour of good daylight left in the day. Schuyler and Buckley were there waiting for me. If Buckley was cooperative, then this rescue could go very quickly. But if he was not, then it could be very difficult, because that long branch gave him plenty of space to get far away from me. Since I needed the ability to walk far out on the limb, I set my climbing line fairly high to make that easier. I was encouraged by Buckley's calm response to this activity. He watched without alarm, and that gave me hope that he would be cooperative. But when I climbed up the tree to his branch, he began walking away from me out to the end. This was discouraging, but I was not giving up hope of winning him over yet. I worked my way out on the branch a few more feet past the point where he was resting in the picture above, yet he was still about 13 feet away from me. I had to try to entice him closer, so I opened a can of food, hung it on the end of a pole, and placed it on the branch as close to him as I could reach. He showed some interest in it, but he would not come much closer, even though he would have still been a safe distance away from me. I pulled it back and presented it to him again. I could see him sniffing the air and licking his lips, but he still would not move toward it. 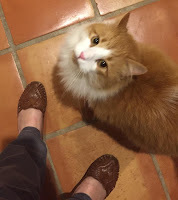 Judging from his response to the food and what I knew about him, I was pretty sure that he would eventually come to trust me and come closer to me. What I didn't know, however, is how long that would take. I can been annoyingly patient, but cats can be even more so. Daylight was fading, and I knew that if I was going to have to use the rescue pole, then I needed to do it while I could still see where the noose was placed. So to hurry this rescue along, I pulled up the pole and began trying to snare him. I extended my pole to its full 12-foot length, and by reaching as far as I could, I was barely able to reach Buckley. It was very difficult to hold the fully-extended pole that far and maneuver the noose around him. My view of him was obscured by the foliage of another tree as well as his long hair, so it was very difficult to see where to place the noose. After several tiring minutes of struggling to get him to step into the noose, I finally snared him. Usually tame cats handle the pole just fine. They tend to go limp as if they were being scruffed by their mama. 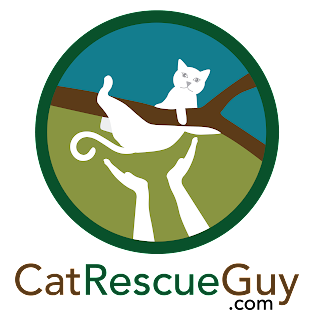 Feral cats, however, are more likely to struggle and fight it. I was expecting Buckley to handle it calmly, but his reaction was immediate and violent. He started fighting it, so I worked to get him to me and into the net as soon as possible. Buckley never gave me a chance. In a matter of a few seconds, he managed to squirm out of the noose and slip out falling to the ground. It was not a long fall, and he ran off immediately to hide. It is painful for me to watch a cat react that way, and it hurts me that I was unable to get him down in a calm, safe manner. Buckley is fine and acts like nothing ever happened, and Schuyler is very happy to have her little boy back home again. But that is not the kind of rescue where I leave feeling good about it, and that is not the kind of rescue video that makes for enjoyable viewing. I wish I had enough skill and foresight to make every rescue go smoothly, but the reality is that these rescues are often risky and unpredictable. Shortly after I left, Buckley came out of hiding and went inside to recover. Schuyler sent me this picture of him looking at her as if to say, "Don't just stand there, mama. Feed me!" I'm glad that Buckley is down and well, and I'm glad that Schuyler is happy with the outcome. She sent me this picture of him resting afterward. Oh how good it feels to be in a soft bed after spending the night in a tree! The next morning, Schuyler let me know that Buckley is still doing fine and not complaining about his experience one bit.